The Niagara Falls Rainforest Cafe is the perfect place to celebrate turning one or one hundred! With an unbeatable décor featuring animatronic gorillas, elephants and more complemented by the soundtrack of the jungle this is one children’s birthday party celebration you will not have to decorate for. For a kid’s birthday party meal that they will always remember the Rainforest Cafe has chosen the most popular menu items including appetizers, main dishes and a special birthday dessert for your guests to enjoy. With so much to see at the Rainforest Cafe including the large Shark exhibit, salt water fish tanks, animatronic gorillas, elephants and a thunderstorm guests at your children’s birthday party will have plenty to be entertained by. 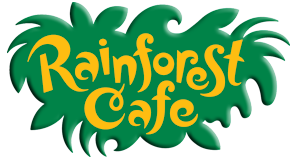 The Rainforest Cafe is the perfect destination in Niagara Falls for team building activities and educational experiences. Allow the Rainforest to plan an outing that will inspire, challenge, and educate your group. Group menus are available, for more information please complete the form below, or contact Tracey Campbell at 905-374-4444 ext. 4910 or traceyc@niagarafallshotels.com. The Rainforest Cafe would like to invite your school group to stay for lunch. Special lunch menu’s are available that include one of three entrée’s, dessert and unlimited soft drinks.